In 2016 Apple announced new incentives for developers to maintain their customers on a continuous subscription for more than a year. 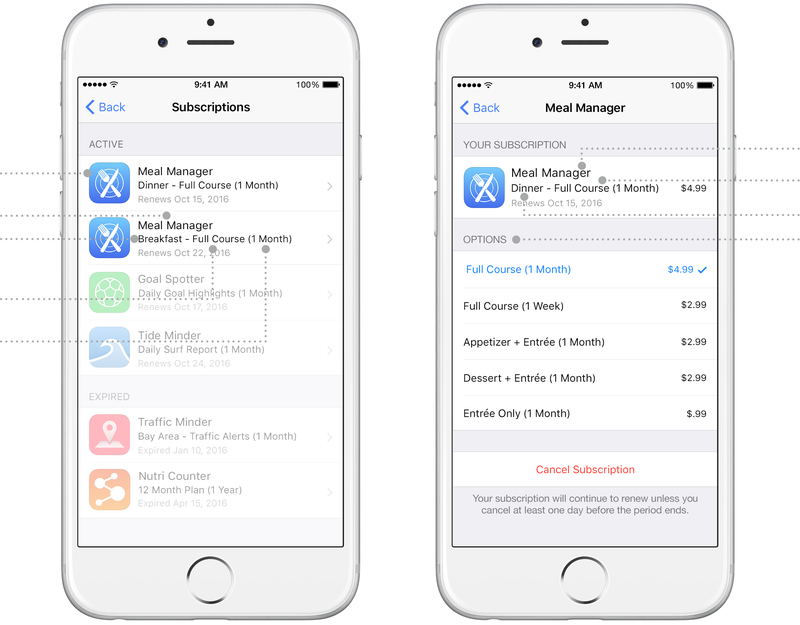 Apple simultaneously introduced subscription groups: a way of grouping subscription products that makes managing active subscriptions easier. It is essential to understand subscription groups before planning your in-app purchases. A subscription group is a collection of subscription products that has some specific properties. No two products in a subscription group can be active at the same time. A free trial or introductory price can only be used once per group. 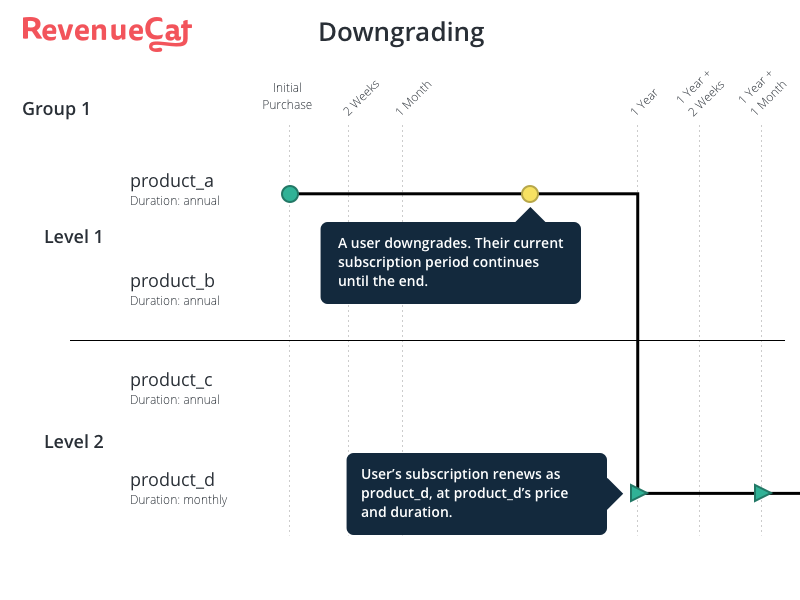 A subscription group also determines the service level of each product, determining the upgrade/downgrade/crossgrade behavior. Subscription groups have localized description data that determine how your app appears in the management menu in the App Store settings. How a subscription group affects what your customer sees while managing subscriptions. Users could now upgrade or downgrade their subscriptions without having to cancel first, wait for the expiration, and re-purchase. Users could no longer accidentally end up with simultaneous subscriptions. The subscription management page in Settings app. In your app by initiating an in-app purchase of a product in the same group as another active subscription product. These options give the user a vastly simplified experience; however, for the developer, there are some considerations. Have Apple’s Status Update Notifications hooked up. If your app doesn’t have any cross-platform features, you could rely on hopefully receiving the SKPaymentTransaction on the next app launch, and refresh your receipt data then. This option doesn’t work if your subscription provides any content outside of the app. If a group already has a subscription, a purchase for a product in the group will initiate a change. After a user has initiated an upgrade, downgrade, or crossgrade, the way that this executes is a little complicated. Upgrading, Downgrading, and Crossgrading! Oh My! To better illustrate these somewhat complicated behaviors, let’s consider a scenario. Below are several examples based on a subscription group that contains two service levels, each which contain two products of varying durations. 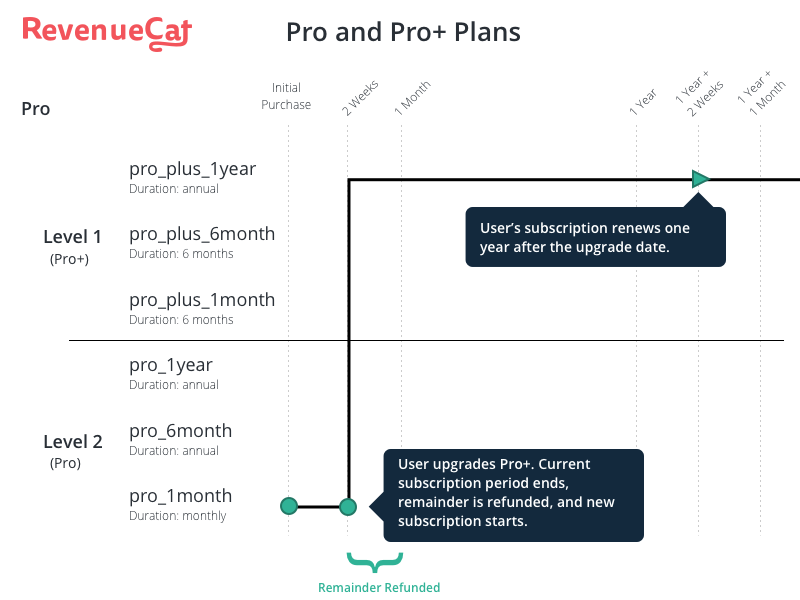 Upgrading from a lower to higher service level stops the current subscription immediately and refunds the remainder of the period, simultaneously initiating a subscription for the new product. Upgrading service levels occurs immediately. Downgrading behaves differently. When a user downgrades service levels, the subscription they currently have always continues until the original expiration date. After that, the new product begins its period. Downgrading doesn’t occur until the end of the current subscription period. Things start to get more complicated when a user moves within the same service level, a.k.a. a crossgrade. How a crossgrade executes depends on the duration of the products involved. 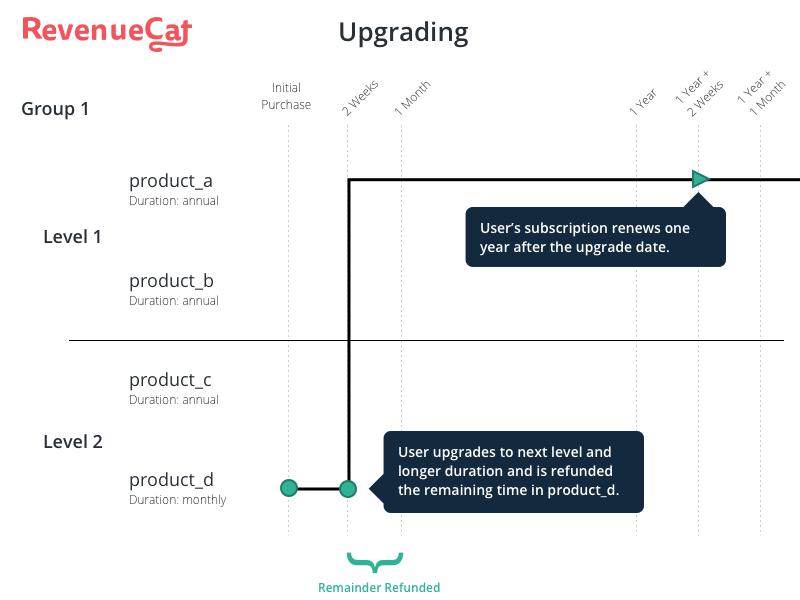 If both products have the same duration, it behaves like a service upgrade, immediately ending and refunding the remainder of the current subscription and initiating the new product’s subscription. 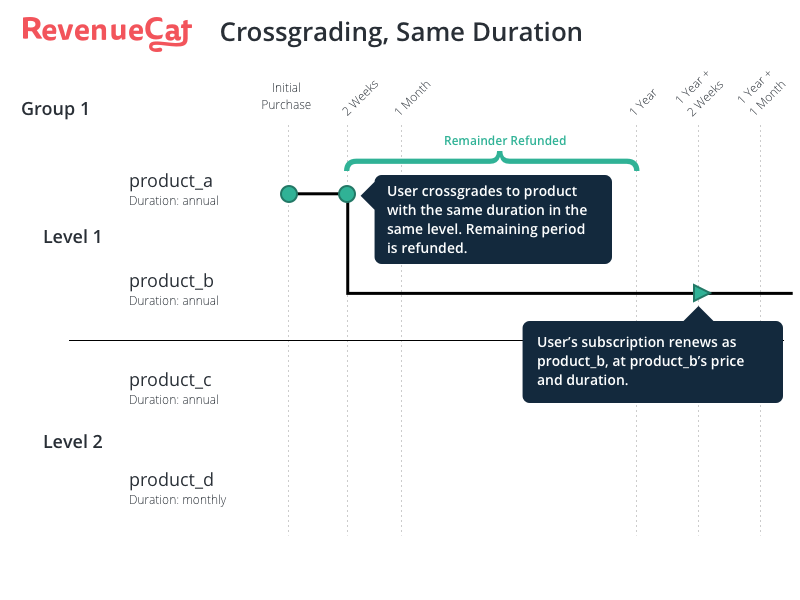 Crossgrading to a product with the same duration behaves like upgrading a service level. When crossgrading between two products in the same service level with different durations, it behaves like service level downgrading. Crossgrading between different duration products behaves like downgrading. For all the complexity, a proper subscription group and service level configuration can create a very smooth experience for the user if executed correctly. For most subscription apps, you can get away with all products in the same group and one service level. This setup would be something like a “Pro” plan, and within that, you had “Pro (1 Month)”, “Pro (6 Month)”, and “Pro (1 Year)”. 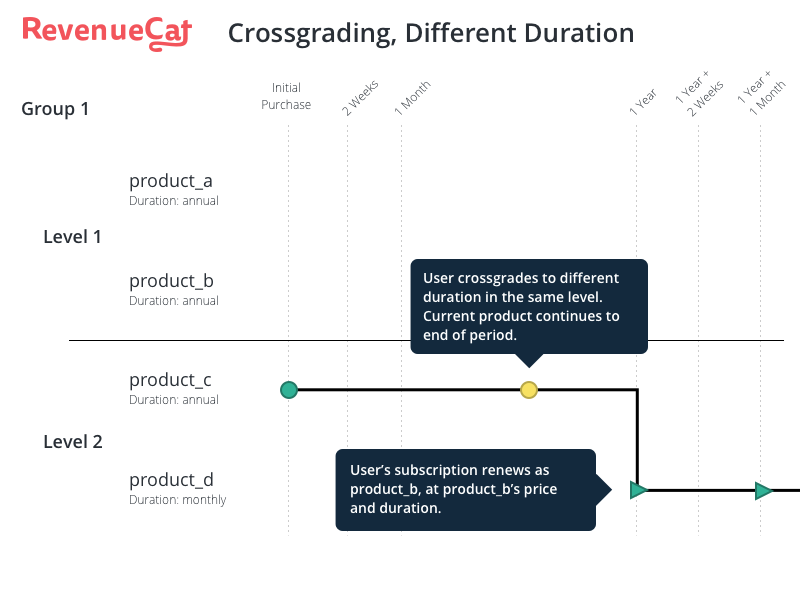 In this case, subscription change behavior will behave as in the “Crossgrading, Different Duration” diagram. A user upgrading and downgrading within one service level. The correct instance to use multiple service levels is when you have differentiated offerings. For example, you may offer a Pro plan and Pro+ plan, where Pro+ provides access to additional features or content. Each plan will have three products, one for each duration. 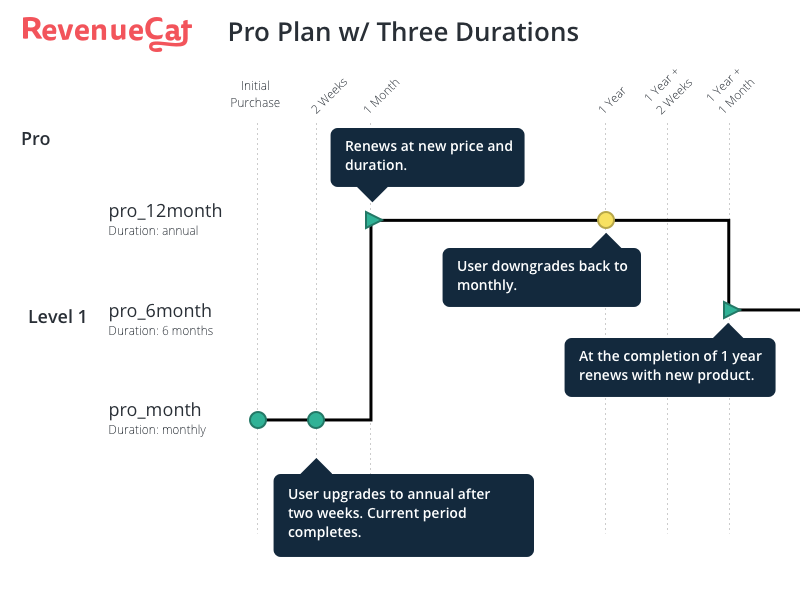 By putting the Pro+ products in the higher service level, users are allowed to instantly upgrade from Pro to Pro+ without having to wait until the end of the current subscription period. Service levels are good if you have a differentiated offering. It’s easy to lose sight of why off this is important: to get users through to one year of continuous subscription. After this point, Apple reduces their cut of revenue from 30% to 15%. 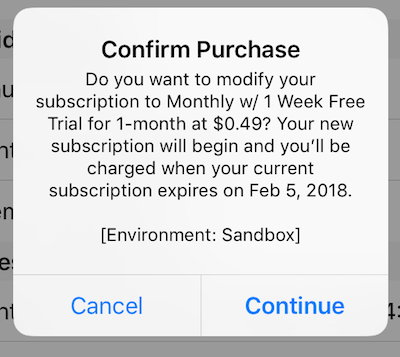 To aid in this, Apple also introduced a 60-day “grace period” following a user canceling a subscription, where, if they resubscribe, they keep their accumulated days. 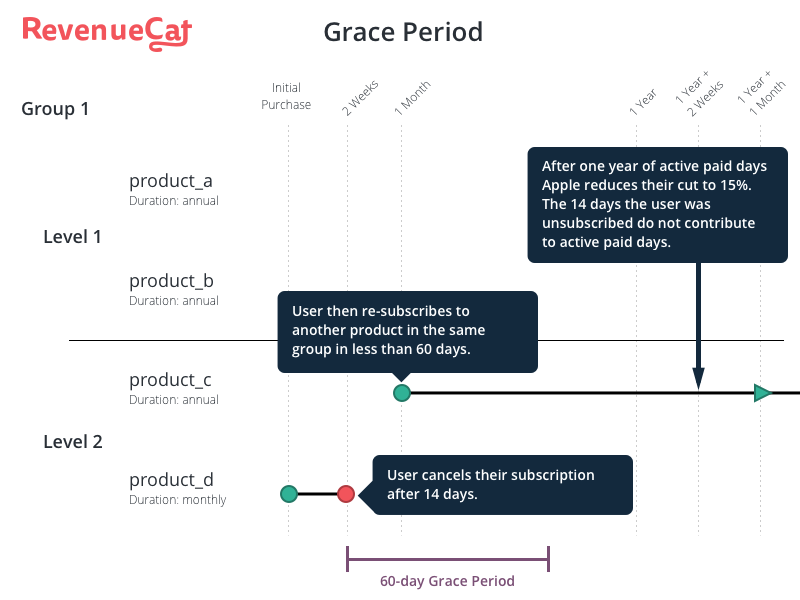 Unsubscribed days during the grace period do not count, however, if the user resubscribes before the end of the grace period, the days accumulated before the cancellation are retained. Subscription groups on balance were a great addition to the iOS subscription eco-system. They protect the user, sensible defaults, and even some opportunities for the developer. Before you launch your subscription in-app purchase product, make sure you take into consideration the specific behaviors of groups and service levels, so that you understand the experience you will be delivering.